New Builds in Harrogate | Looking to Build Your Own Home? I & C Watts are well known builders of new homes in Harrogate with a reputation for constructing highly individual high quality homes based on client requirements, coupled with customer service standards that result in consistently high levels of satisfaction. Recently we have also started building a new range of environmentally and ecologically friendly developments, please see our Eco Builds page for more information. New houses are being built to exacting customer specifications because even during these hard economic times it is still great value for money to live in that dream home. Currently as many as twenty thousand new homes are built in the UK each year by customers who wanted to build something unique. It is often better value for money to build your dream home on a plot of land than it would be to buy the same house prebuilt. This provides a great investment opportunity storing equity in the property based on its resale market value. All our new builds come with a NHBC warranty which covers the majority of the building work for up to 10 years. Although we guarantee our work this warranty provides long term peace of mind. Building your own home allows you to utilise modern technologies at a greatly reduced cost because they can be incorporated into the design from the beginning as opposed adding on components to an existing dwelling. Designing your dream home allows you to create a floor plan that suits your lifestyle and is often the most rewarding aspect of building a new house. It allows you to choose the size and numbers of rooms you want; tailoring the look and functionally both outside and inside your home. All new building projects now have to incorporate some form of sustainable technology to meet more stringent building regulations. 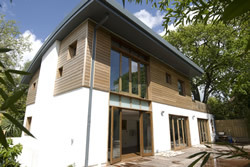 New builds can benefit from the latest construction materials available on the market today. This reduces building costs while at the same time providing a more energy efficient and lower maintenance home. The building work involved varies dependent on many factors, I & C Watts are happy to provide a free consultation anywhere across Harrogate and the surrounding areas and give you an idea on how to move forward with your project.